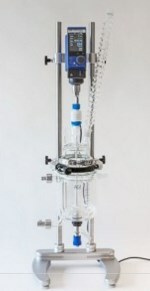 The ReactoMate CLR Datum Support System is a NEW benchtop Controlled Lab Reactor system that offers the flexibility to accommodate reaction vessels from 100ml to 5 litres. Vessels can be easily exchanged on the ReactoMate Datum allowing you to quickly change between reactor vessel sizes thereby enabling simple synthesis scale-up. A novel mounting mechanism on the stylishly designed ReactoMate Datum ensures excellent stability and alignment every time too, and is easily set up for left or right handed use. Stunning, safe, practial CLR system for 100ml to 5000ml. Constructed from anodised aluminium and stainless steel for the ultimate in quality, strength and reliability. Fully compatible with all leading brands of overhead stirrers and circulator heating/cooling systems. Built to operate over a temperature range from -70oc to +220oC the ReactoMate Datum PT100 temperature probe linked directly to the heating/cooling circulator ensures accurate solution temperature temperature control. Optional automation packages for this system are available upon request. There are no threads in Asynt ReactoMate CLR Datum Reviews at this time.